After more than three years of sustained conflict, Yemen continues to face a series of humanitarian, social and economic challenges. 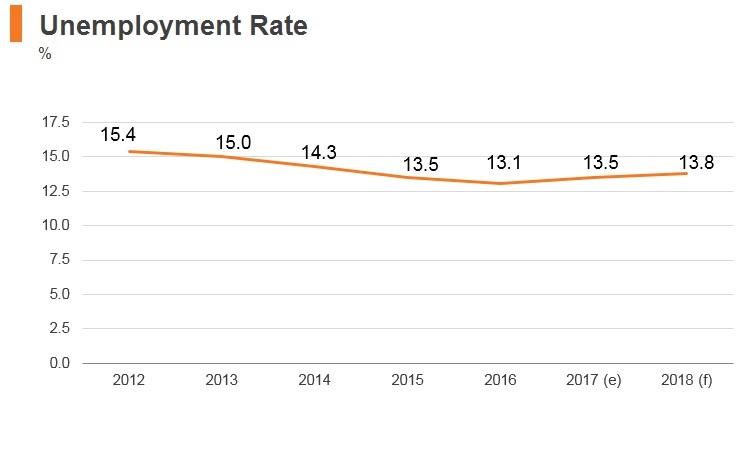 Yemen’s public institutions are struggling with service delivery at even the most basic levels, and the situation has further been complicated by the lack of regular salary payments to many public workers. Moreover, the economy is badly hit by the prolonged conflict, which is a key factor depriving millions from their livelihoods and jobs and driving poverty levels to over 80%. Leader of Al-Qaeda in Arabian Peninsula, Nasser al-Wuhayshi was killed in US drone strike in Yemen. President Hadi returned to Aden after Saudi-backed government forces recaptured the port city from Houthi forces and launched an advance on Aden. UN-sponsored talks between the government and Houthis and former President Saleh's General People's Congress (GPC) commenced. A US raid on several suspected Al-Qaeda militants and civilians marks the first US military action in Yemen under President Donald Trump. China provided a grant of USD22.5 million in relief assistance to the Yemeni government. Former president Ali Abdullah Saleh was killed after fierce fighting in the capital Sanaa. Southern Yemeni separatists - backed by the United Arab Emirates - seized control of Aden. Yemen acceded to the WTO in 2014 and is also a member of the Greater Arab Free Trade Area (GAFTA). Yemen has been a member of the League of Arab States since March 1945. The league consist of 22 members including GCC and other Arab countries. 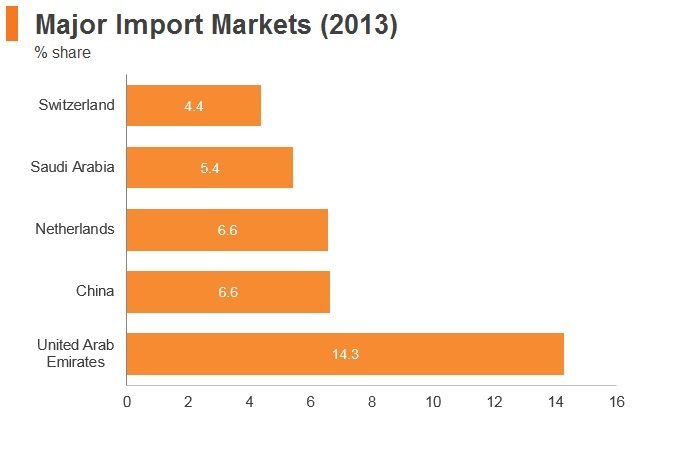 Nevertheless Yemen still applies high custom fees on regionally traded products. Use of non-tariff barriers has sometimes led to the delay or rejection of goods shipped to Yemen but this is not common practice. In the past, Yemeni importers have experienced extended delays in customs clearance for the reason of reciprocity when Saudi customs stop or bans the Yemeni agriculture products for health or other reasons. 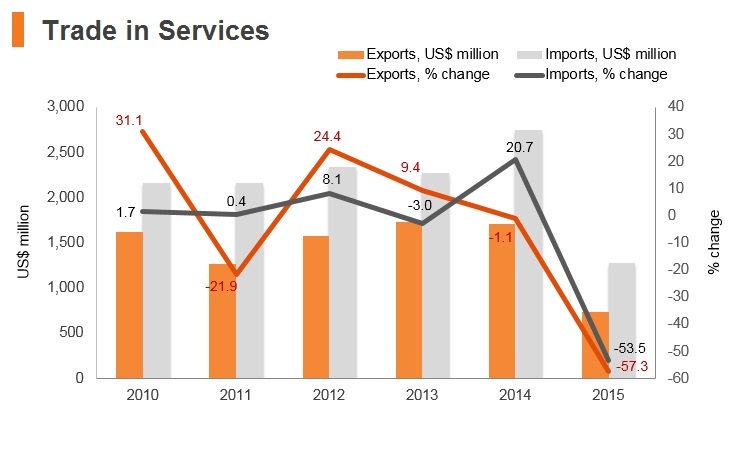 Restrictions on Saudi transportation trucks, in addition to regional insecurity and high transportation costs affect the handling and delivery performance of export and import products. The existence of some trademarks infringements, shows that intellectual property rights are still a nascent area in the country. Some import restrictions apply and duties are applied to protect local industries. 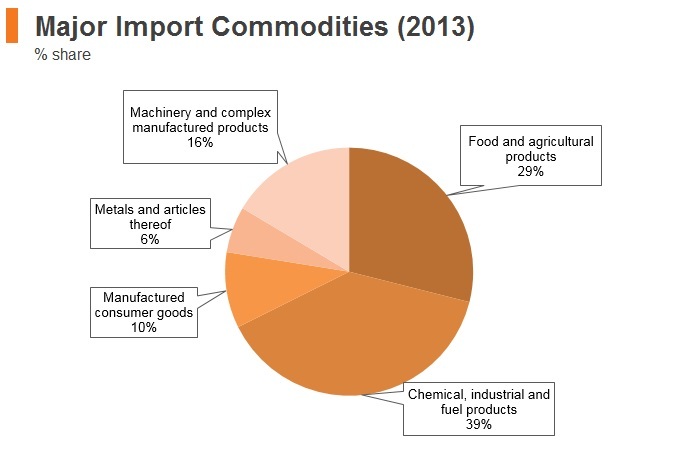 According to the latest available data, goods that enter the territory of Yemen are subject to customs fees as per the following: raw materials 5%, semi-manufactured materials 10%, ready materials 15% and other items face the highest rate of customs fees 25%. Customs fees are charged on imports on the basis of ordinary value of the goods and includes shipment charges and insurance. In terms of the basic labelling requirements, the production and expiry dates, in both Arabic and English must be printed clearly on the packaging of all foodstuff or pharmaceutical products imported into Yemen. For all other products, GCC or International Standards apply. Imported beef and poultry products require a health certificate and a halal certificate issued by an approved Islamic centre in the manufacturer country. The import of pork and pork products, coffee, alcohol, narcotics, some fresh fruit and vegetables, weapons and explosives and rhinoceros horn is prohibited. A health certificate is required for shipments to Yemen of animal stocks, food and agricultural products. Free Sale Certificate Imports of pharmaceuticals require a Free Sale Certificate stating that the commodities in question are in free circulation in the country of export. All freight insurance on imports must be placed in Yemen. Yemen has stated that it will continue to implement the primary aspect of the Arab anti-Israel boycott. Yemen is a small oil-producing country outside of OPEC. Yemen allows foreign oil companies to exploit its oil fields in light of their capital and technology resources. Prior to the civil war in 2015, the oil sector accounted for 65% of its fiscal revenue and one-quarter of its GDP. Yemen’s oil exports have been suspended since early 2015, with the ongoing conflict disrupting oil production, including facilities operated by foreign investors. Small-scale oil exports from Yemen resumed in 2017. International oil companies in Yemen, such as Austria’s OMV are also looking to resume oil production in south Yemen in the near term (contingent on a climb down in conflict risk). Yemen acceded to the WTO in 2014. 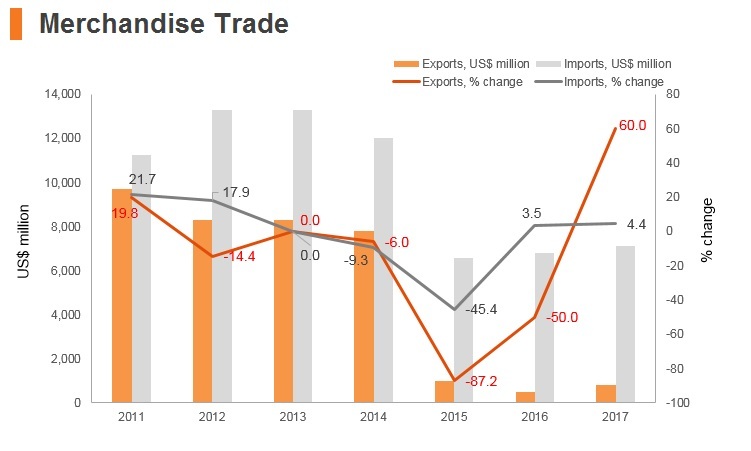 Yemen’s WTO accession may eventually lead to a freer and more open investment climate for international investors in the years ahead. Yemen is a member of the Greater Arab Free Trade Area (GAFTA). GAFTA provides dynamic gains associated with the flow of exports and imports for members at preferential rates, which supports improved productivity and lowers trade cost. Yemen’s General Investment Authority (GIA) is the national agency for FDI promotion and coordination. 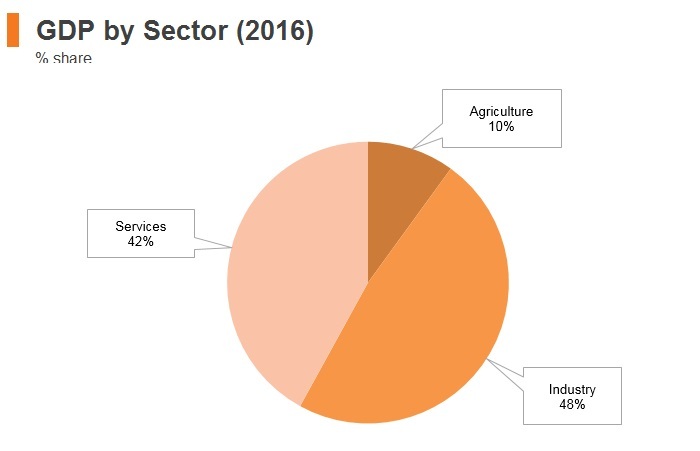 Incentives are offered to foreign companies investing in sectors targeted for development, including agriculture, transport, housing, tourism and industrial zones. In 1992, the government adopted a uniform investment code for both domestic and foreign investors which created the GIA to coordinate work among eight government agencies. In attending the Belt and Road Summit in Beijing in May 2017, the Yemeni delegation presented the country’s needs to reconstruct and develop infrastructure, calling for investment in the energy and mineral sectors. In July 2017, China provided a grant of USD22.5 million in relief assistance to the Yemeni government. 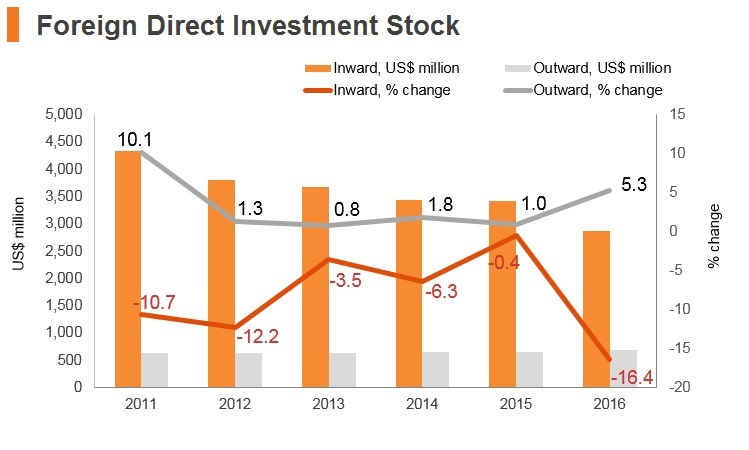 Apart from trade with Yemen, many Chinese enterprises have invested in the country, particularly in the oil fields exploration (eg Sinopec) and telecom infrastructure (eg Huawei). In 2002, GIA worked with the World Bank's Foreign Investment Advisory service to update Yemen’s investment laws, reducing customs duties by 50% on imported raw materials and 100% on raw materials produced locally for agricultural and fisheries projects. Investments in the oil, gas, and mineral sector are subject to special agreements under the authority of the Ministry of Oil and Minerals and do not fall under GIA’s authority. 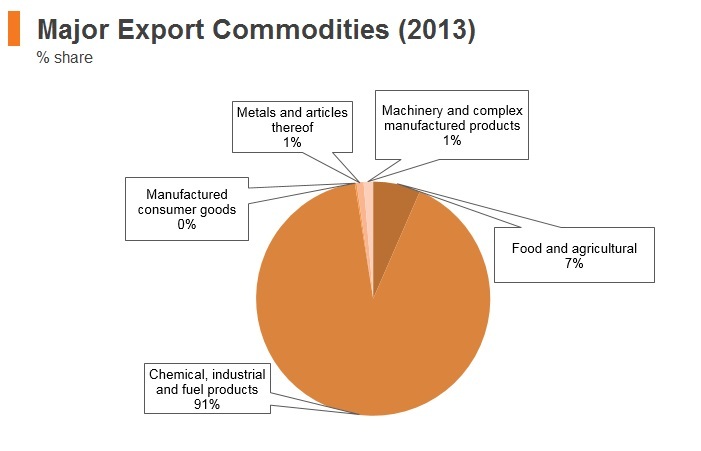 Other sectors not covered by GIA include weapons and explosives manufacturing, banking and money exchange activities, and wholesale and retail imports. 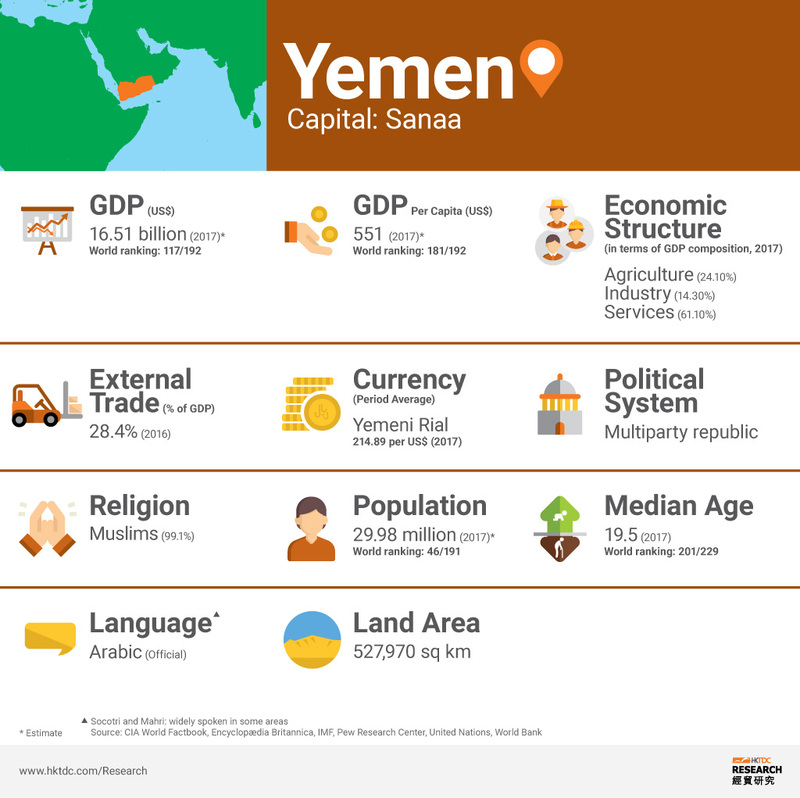 Since the unification of North and South Yemen in 1990, Yemen has embarked on a series of reforms aimed at stabilising the economy and increasing foreign investment. Reforms include the introduction of a General Sales Tax (GST) and a reduction in domestic petroleum and food subsidies. The IMF has helped introduce indirect monetary policy instruments, such as open market operations, rediscount facilities, and reserve requirements. Between 2003 and 2004, eight state-run companies were privatised, seven of them by public auction, with the remaining company being transferred to the Yemeni Economic Corporation (YEC). In 2007, the government announced the privatisation of an additional 15 factories. The Central Bank of Yemen (CBY) has made an effort to improve commercial banks’ accounting procedures and loan recovery rates. The banking system remains weak, however, with most commercial banks owned by large families who are reluctant to lend outside small circles. Foreign investors generally seek capital from outside the country. Investors may transfer funds in foreign currency from abroad to Yemen for the purpose of investment and may re-export invested capital, whether in kind or in cash, upon liquidation or project disposal. Net profits resulting from investment of foreign funds may be transferred freely outside of Yemen. Cash transfers are limited to USD10,000. Transfers above that amount must be approved by the CBY. Since Yemen’s unification in 1990, there have been no cases of outright expropriation of property owned by foreign investors. Yemen's investment law stipulates that private property will not be nationalised or seized, and that funds will not be blocked, confiscated, frozen, withheld, or sequestered by other than a court of law. Real estate may not be expropriated except in the national interest, and expropriation must be according to a court judgment and include fair compensation based on current market value. 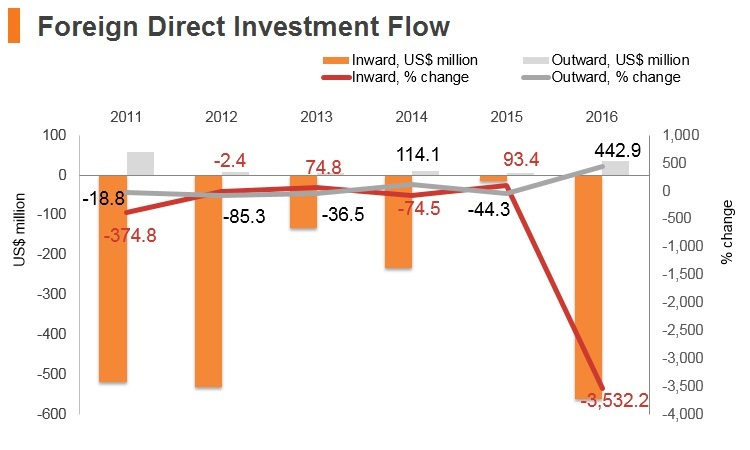 Yemen’s collective body of investment laws does not specify performance requirements as conditions for establishing, maintaining, or expanding investment. Law 23 of 1997 (as amended) regulates agencies and branches of foreign companies and firms and outlines the requirements for establishing a Yemeni agent. Chapter 3 of Law 23 permits foreign companies and firms to conduct business in Yemen by establishing foreign-owned and managed branches. Foreign commercial entities wishing to open branches in their own name must obtain a permit from the Ministry of Industry and Trade. Under a 2002 investment law, foreigners can own 100% of the land and can execute projects without a Yemeni agent and without obtaining import/export license from the Ministry of Industry and Trade or implementing Law 23 of 1997 (the investment law implemented in October 2002 has precedence over other laws). The 2002 investment law appears to contradict longstanding Yemeni commercial laws, however, which limit foreign ownership to 49%. In March 2008, the government amended a 1991 investment law allowing foreigners to operate businesses in Yemen without a Yemeni partner. The government is reviewing the laws in an attempt to remove inconsistencies, although work on the issue was temporarily suspended in 2011 as a result of the political crisis. Mortgage lending in Yemen is rare because of the unwillingness of the court system to uphold the payment of interest or to accept land as a form of collateral - all products in this arena must be Shari'a compliant. In addition, Yemen has a long history of incomplete or inaccurate land records and frequent land ownership disputes, making the use of real estate as collateral difficult. In 2006, various agencies and ministry departments dealing with land ownership were merged into a common General Land Survey and Planning Authority. This fairly new organisation oversees land ownership and registration, as well as modest government urban planning efforts. In May 2011, armed clashes damaged the General Land Survey and Planning Authority’s headquarters. Authorities have also reported looting of documents and equipment in the building. Yemen has a record of inadequate protection of intellectual property rights (IPR), including patents, trademarks, designs, and copyrights. In late 2004, the Cabinet approved the Berne Convention for the Protection of Literary and Artistic Works, as well as the International Agreement on Protecting Intellectual Property Rights. Parliament has yet to ratify these agreements. Yemen has yet to accede to any international IPR conventions and its IPR Law Number 19 of 1994 is not compliant with the WTO’s Agreement on Trade-Related Aspects of Intellectual Property Rights (TRIPS). In December 2010, the legislation of Trade marks & Geographical indications, the amendment on trade registration law, the legislation of industrial design, Patent and Author law have been passed and approved by the parliament. Outside investors are best served by establishing a partnership with a Yemeni entity that knows the system, including an international arbitration clause in their contracts, establishing an escrow account and, where appropriate, demanding as much of the payment as they can get up front. In cases involving interest, most judges use Shari'a (Islamic) law as a guideline, under which claims for interest payments due are almost always rejected. Local commercial banks are sensitive to this problem, and lend primarily to large established trading houses well known to them. The Yemen Free Zone Public Authority was established in 1991 to develop the Aden Free Zone (AFZ). Yeminvest, a joint venture between the Port of Singapore Authority and the Bin Mohfoud Group of Saudi Arabia, was awarded the concession to develop the area. Dubai Ports World (DPW) now operates the Aden Container Terminal) in the AFZ. An industrial and warehousing estate called Aden District Park (ADP) was launched in November 2002. Furthermore, investment opportunities in light industry, repackaging and storage/distribution operations are welcomed. The free zones bill stipulated prospects for the establishment of other free zones in Yemen and the AFZ Public Authority is undertaking the relevant studies identifying such zones and relevant investment opportunities. The Yemen Free Zone Public Authority was established in 1991 to develop the Aden Free Zone (AFZ). Free zone incentives include the possibility of 100% foreign ownership, no personal income taxes for foreigners, and a corporate tax holiday for 15 years (renewable for 10 additional years), 100% repatriation of capital and profits, no currency restrictions, and no restrictions on, or sponsoring required, for the employment of foreign staff. Aden’s main selling point is its strategic location - particularly its proximity to Europe, Arab peer states and Asia. Projects at development stage includes, cargo and air cargo village, heavy industry and petrochemicals estate, tourism estate and an international trade centre. General incentives Incentives permitted under the law include, but are not limited to: exemption from customs fees and taxes levied on fixed assets of the project; tax holidays on profits for a period of seven years, renewable for up to 18 years maximum; the right to purchase or rent land and buildings; and, the right to import production inputs and export products without restrictions and registration in the import/export register. Corporate Tax Rates (other rates by sector) 50% rate for mobile telecommunications companies. 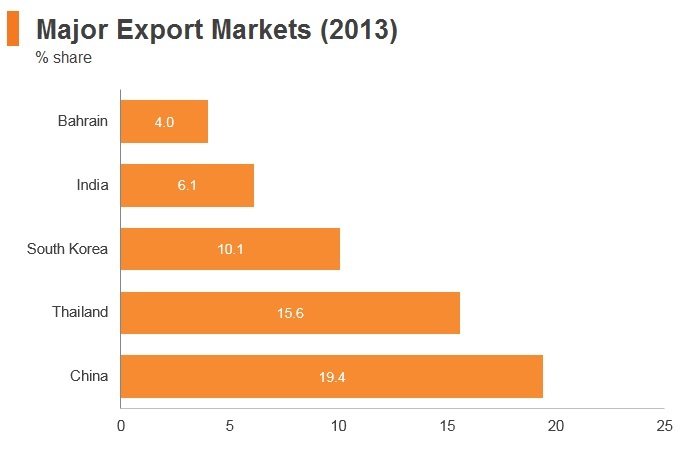 A 35% rate applies to international telecoms service providers, cigarette manufacturers and importers. Visitors to Yemen must obtain a visa from one of the Yemeni diplomatic missions unless they come from one of the visa countries whose citizens may obtain visa on arrival. 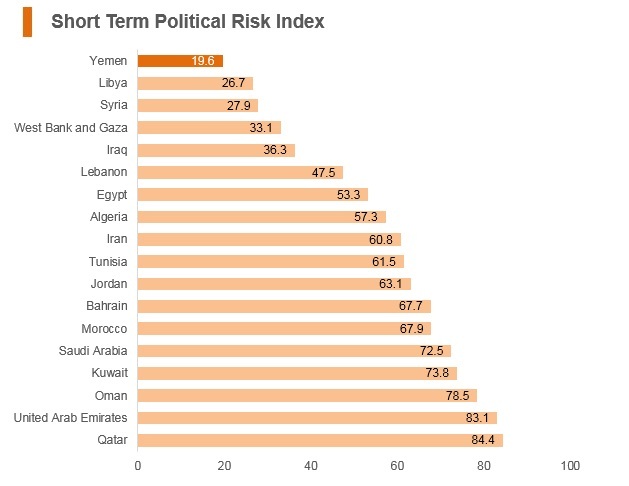 Until January 2010, Yemen had a visa on arrival policy for some 50 countries (predominantly Muslim). Tourist and/or business Visas are required by all except nationals of Iraq, Jordan and Syria, but citizens of these states must still get a doctor to confirm that they are good health. All applications are referred to Yemen and can take one to two months for the approval. Single entry visas are valid for three months, and multiple entry visas are valid for six months. Visitors must register with Yemeni authorities if they plan on staying in Yemen for longer than two weeks. Yemeni law requires that all visitors/tourists register at a Yemeni police station or at the Passport and Immigration Authority within two weeks after arrival to Yemen. Failure to register will result in complications upon departure and a possible fine. Getting a work visa for Yemen is difficult. Applicants will first need to get a Work Permit from the local authorities in Yemen. The Yemeni-based employer must assist in procuring the work permit and then the applicant must consult the consulate to find out specific terms for getting the work visa. According to the labour law of Yemen, foreign employees will be at risk of having their work permit revoked if they do not perform the works for which they are employed or lose vital qualifications that are required to execute the job. such other information as may be required by the Ministry or its competent office. some other related documents or information as the Ministry or its competent office may request. the Ministry ascertains the possibility of nominating a worker to the advertised vacancy. Residence permits are issued by the Passport and Immigration Authority, which is a department of the Ministry of Interior (the Ministry of Interior is located on Airport Road in Sana’a). In order to obtain a residence permit, foreign citizens must be sponsored by a Yemen-based individual or organisation. Foreign citizens with a valid residence permit wishing to leave Yemen are required to obtain an exit visa. The exit (and re-entry) visa is valid for two months from the date of issuance or until the date the residence permit expires, whichever comes first. Visitors holding Israeli visas (or other Israeli entry documents) are denied entry to Yemen. 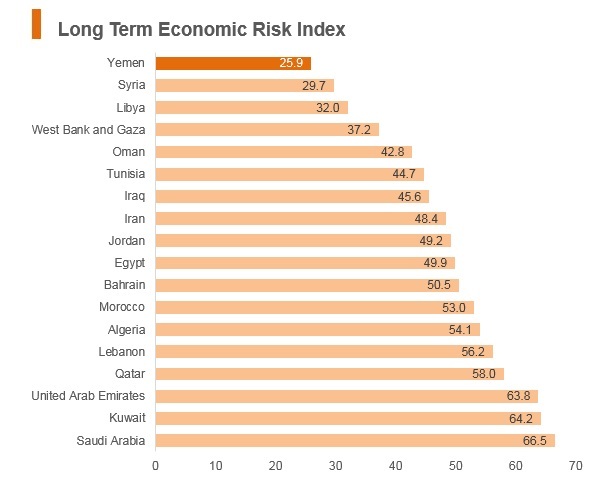 The economic gap between Yemen and the rest of the Middle East remains considerable. In order to improve the situation, Yemen needs investment in education, agriculture and infrastructure that is unlikely to materialise for several years. 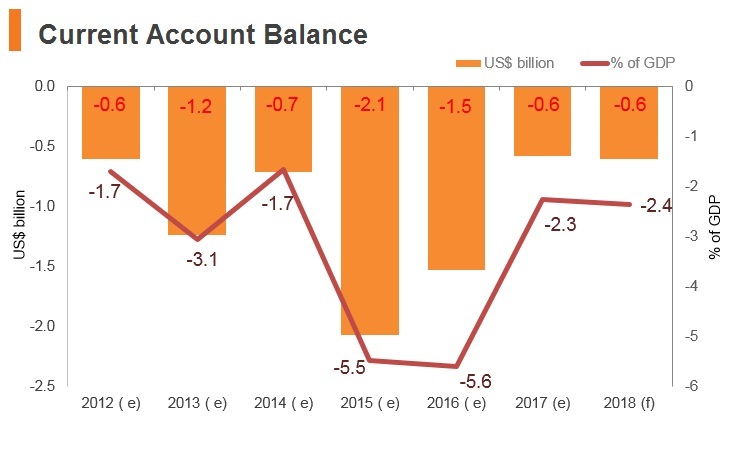 The ongoing conflict will prevent a sustained uptick in Yemen's hydrocarbon exports over the quarters ahead, ensuring continued depreciation of the rial and associated elevated inflation. 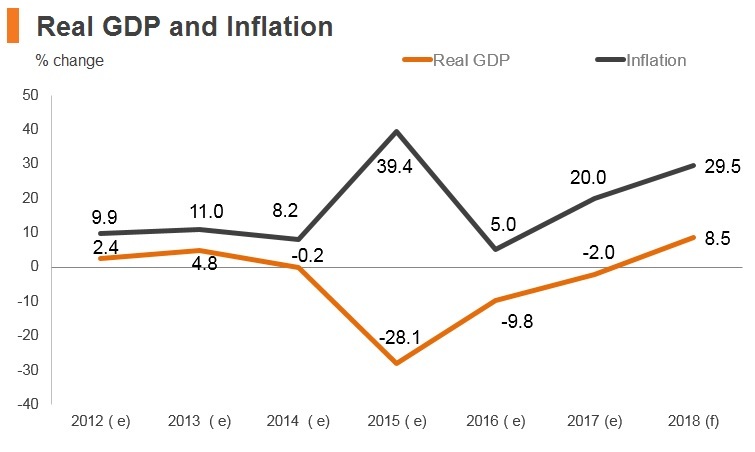 Coupled with the government's waning ability to pay out public sector salaries, this will cause consumption to fall in the near term. 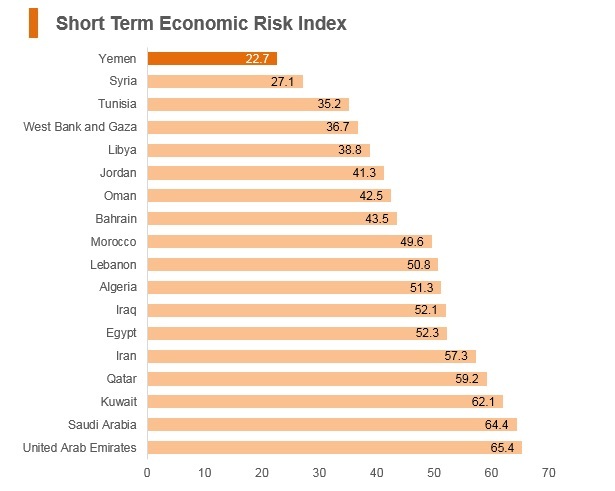 Yemen's economic recovery will rely on foreign assistance and the country is highly vulnerable to external shocks. Another drop in oil prices could, for example, prevent Gulf allies from helping to finance reconstruction. Yemen is a small oil-producing country outside of OPEC and economic diversification outside of the oil sector is limited. 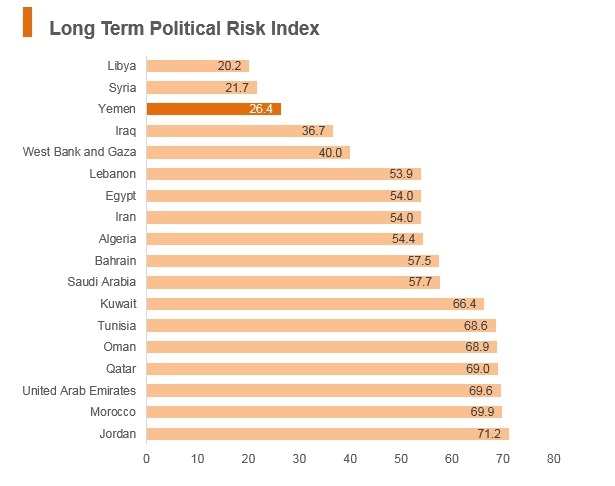 Yemen faces recurring problems with terrorism and tribal violence which will preclude educational attainment in affected areas and large logistics capacity enhancements in the short-to-medium term. The country has suffered from persistent geopolitical instability despite the 1990 merger of North and South Yemen. It has been locked in a complex civil war since 2015 and the prolonged civil war has led to political, macroeconomic and humanitarian crises in the country. The UN's renewed push to negotiate between the main parties of the Yemen conflict is unlikely to produce a lasting resolution, as neither side appears willing to compromise at this stage. The Houthi rebels will continue to fire missiles into Saudi territory over the quarters ahead, creating potential for further conflict escalation, and keeping Saudi-Iranian tensions elevated. Yemen has a Bilateral Investment Treaty with the People's Republic of China which entered into force in April 2002. The Arab Chamber of Commerce & Industry (ARABCCI) was established in Hong Kong 2006 as a leading organisation at promoting commercial ties between Hong Kong/Greater China and the Arab World. From a base of eight founding member companies, ARABCCI has now evolved to include an ever-growing number of members. The Chamber is run by business experts for business professionals, dedicated to opening enormous trade opportunities by providing extensive information and professional services to its members. House of Business: 10:00 a.m. - 5:00 p.m.